Massachusetts has more than 120 visitable breweries, 19 of which are in the Valley. That’s a lot of taprooms to keep a Beerhunter busy around Franklin, Hampshire, and Hampden counties. Still, you can’t cover beer news in Western Mass without fully appreciating what “west” means. Berkshire County boasts five breweries. The oldest is Barrington Brewery in Great Barrington, which opened in 1995. Although that taproom has always been a fun destination, a bit of a lull in new breweries followed. Then finally, a few years ago, craft beer caught on in the Berkshires. Wandering Star Craft Brewery in Pittsfield opened in 2011, followed by Big Elm Brewing in Sheffield the following year. 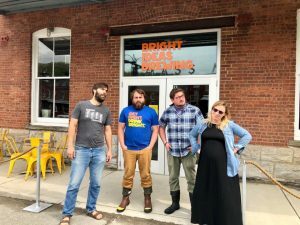 In North Adams, Bright Ideas Brewing opened its doors in 2016. And just last year, Shire Breu-Hous opened in Dalton. That might not seem like many stops on your craft beer road map. But there’s (liquid) gold in these hills. From left: Visiting brewer Christophe Gagné from Hermit Thrush Brewery, Bright Ideas head brewer Danny Sump, Bright Ideas assistant brewer Connor Mackenzie Johnson, and Bright Ideas operations manager Colleen Rafferty. Perhaps the biggest brew news is out of North Adams, where a new head brewer at Bright Ideas began work in April. Danny Sump, 31, moved to the northeast a few months ago (he and his dog now live around the corner from the brewery, which is just outside the main entrance to MASS MoCA). Sump previously worked at Wicked Weed Brewing in North Carolina. Later, he moved to Virginia for a job at the San Diego-based Green Flash Brewing Company, which operated a short-lived facility in Virginia Beach. When I sat down with him at the brewery, I couldn’t help but ask Sump about his roller-coaster ride of employment. As I explained in a recent column, Wicked Weed took major flak from the craft beer world in May 2017 after announcing that it was being purchased by the corporate giant Anheuser-Busch InBev — a move that has seriously dinged Wicked Weed’s working relationships with other craft breweries (Sump quit the company when he heard the news, as did several colleagues). Green Flash fared even worse: after expanding in 2013 and opening the Virginia Beach facility in 2016, the company hit a financial downslide. In April, its main lender foreclosed on a defaulted $20 million loan, then sold the brewery to a private investor group. Green Flash’s automated brewhouse was a far cry from the Wicked Weed cellar. There, Sump learned about technical brewing, working with lab techs on diagnostics to test beer for consistency. When you add in the hours spent on the canning, bottling, and packaging lines — plus Sump’s shorter brewing stints around Virginia at O’Connor Brewing Company and at Wolfe Street Brewing — it’s clear that he comes north with some experience — and good recipes — in his pocket. 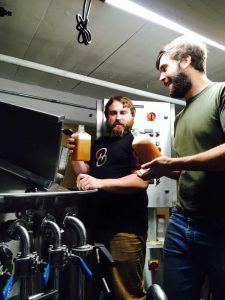 Danny Sump, the new head brewer at Bright Ideas Brewing in North Adams, collaborates with Christophe Gagné from Hermit Thrush Brewing in Brattleboro on a sour IPA for the Bright Ideas taproom. The result of one of these recipes sat on the table between us. While we talked, we sipped on a new Bright Ideas beer called Brux Capacitor, a juicy tropical IPA brewed with a yeast strain called saccharomyces bruxellensis trois (just call it “brux,” please) that adds some nice notes of mango, peach, and pineapple to a smooth and silky beer. The tap menu changes regularly, but on my visit it showed impressive variety. Sump has brewed a lager with Italian ingredients called Luminosa Pilsner, a double IPA called Afterbrite, an homage to soft serve ice cream called Dairy Bar Porter, and a golden ale infused with cucumber and basil from True Love Farm in North Bennington, Vermont. Coming soon to this seven-barrel brewhouse: a pink guava gose, a red ale, a single-hop Citra pale ale, an Australian dry-hopped table beer, a barrel-aged imperial stout, and a rotating New England IPA series. Plus, of course, a blonde ale in time for the Blondie concert next door at MASS MoCA on August 3. Chris Post, owner/brewer at Wandering Star Craft Brewery, works at his taproom in Pittsfield (with Fuggle the brewery cat) in November 2015. Sump is stepping in to take the place of interim head brewer James Hardman, who had come in from Foundation Brewing Company in Maine to work at Bright Ideas for six months. Hardman, in turn, was filling the shoes of brewer Chris Post, who helped to open Bright Ideas in 2016 but who suffered a nasty injury last year at his own Wandering Star Craft Brewery in Pittsfield — a brewery he retained while working at Bright Ideas. On Easter Sunday 2017, a clamp on a hose came loose while Post was cleaning up after brewing. The blast sprayed him with high-pressure, 208-degree water, causing second- and third-degree burns on his legs and feet. The accident took Post away from his work at both Bright Ideas and at Wandering Star for a fair chunk of last year. Wandering Star, being family-owned, was there for Post when he got back. But it proved a rather unceremonious end to his tenure at Bright Ideas, which had its own goals to hit (hence the temporary hire of Hardman). As he recuperated, Post retained his official involvement with Bright Ideas. But as local support poured in, and Post saw Wandering Star in a good position to grow, it soon became clear that a separation might be best. So Post no longer splits his time between Pittsfield and North Adams. And things are going quite well at Wandering Star, where Post has added a beer garden to the taproom, bought a canning line, and secured some high-volume local draft contracts including Tanglewood, Jacob’s Pillow Dance, Wahconah Park (home of the Pittsfield Suns), and opening night receptions all summer at the Berkshire Theater Group. As for that beer that really burned going down: it was a sour, which Post named Twisted Blister (ouch). Although I wished Post the best following his accident, I recently realized that I had never sampled the sinister liquid that had wrought such havoc on his gams. On a whim, I stopped in. 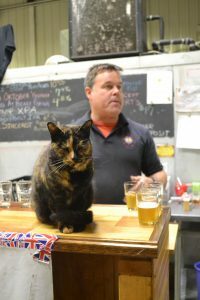 It turned out that Post had an extra can of the stuff, and we cracked it open together at the taproom while Fuggle, the brewery cat, monitored our moves with a suspicious glare. It turns out the gose has aged nicely. I enjoyed it after sampling a really nice tangerine cream ale, which Post says has been selling quite well this summer. 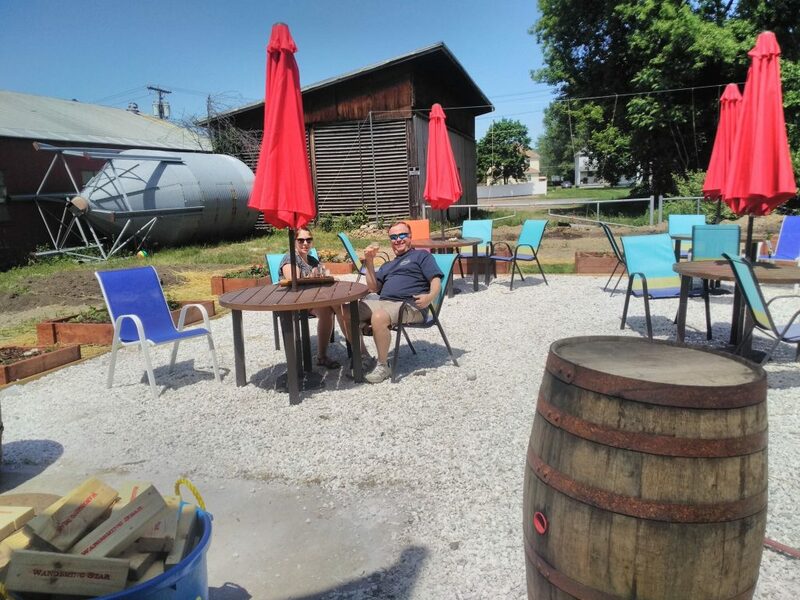 Visitors at the new beer garden at Wandering Star Craft Brewery in Pittsfield. The taproom is now open on Sundays as well as Saturdays. Post said he’s looking forward to putting renewed focus into retail — Wandering Star self-distributes to package stores in Berkshire County — so that cans can be found more readily. Loopy Juice, in particular — his signature double IPA — sells better than every other Wandering Star beer combined. Post is intrigued by a very dry style, inspired by champagne, called “brut IPA,” and intends to brew one soon. He has also started a taproom series in which he invites a handful of homebrewers to come by, take the first runnings of a regular brew, and do what they want with it before it’s fermented. Their most recent visit transformed Post’s Catcher in the Rye — a rye amber ale — into a Wee Heavy Scotch ale that clocks in at a massive 14.5 percent ABV. That small-batch beer hit the taproom on June 30. It will be an exciting year for Wandering Star, he said. Production has recently increased by nearly a third. “This is our first summer that we’ve really got stuff in the package stores, it’s the first summer that we’ve built out our tasting space, and it’s the first time that we’ve got the beer garden,” he said. The taproom is now open on Sundays as well as Saturdays. A batting cage out back, he slyly hints, may be coming soon. Post has met Danny Sump, and is eager to see what the future brings for Bright Ideas. Although he described his time in North Adams fondly, he added that his departure was “the right thing to happen,” because “it enabled me to come back and concentrate more on the things that really need doing here … it was a very valuable experience, to build a brewery and do something on a different kind of budget. I really enjoyed it.” Yet he would say he’s better off now in his own domain, looking to grow, explore, and make more of the good stuff.